As some of you might know, Halloween is my FAVORITE holiday! :) I love making my own costume, dressing up and going to parties. This year was no different! 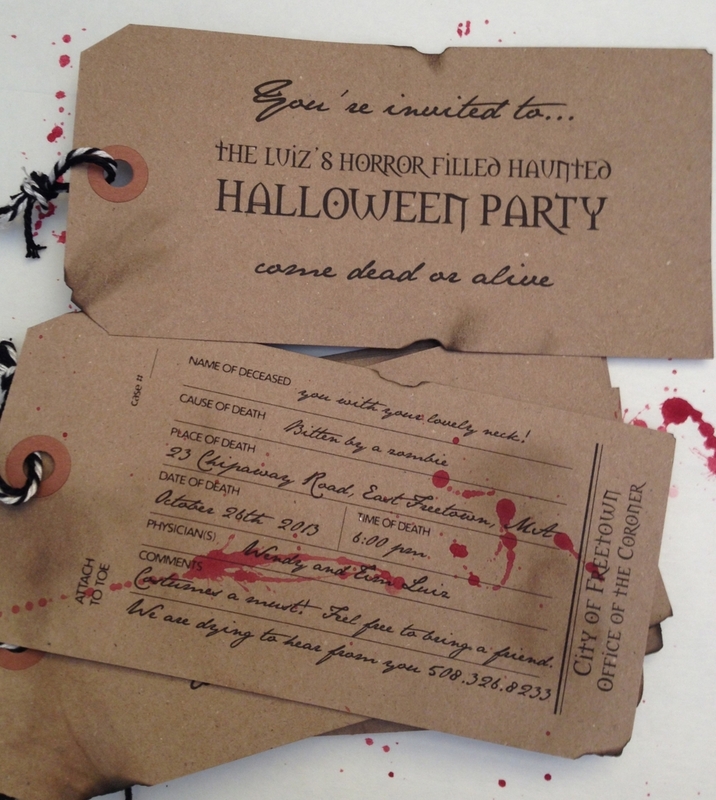 As you can see I made the invites again this year, toe tags complete with splattered "blood". This was my Halloween costume inspiration! I had seen this picture on Pinterest earlier in the year and knew that I had to do something of a black bird /raven /plague doctor so my idea started from there. I wanted to do something creepy yet different... My idea of having a large head dress and wearing all black turned into me making my head piece from a masquerade mask and lots of feathers! The mask had a gold star on it so I painted it all black and then started glue, glue, gluing lots and lots of feathers to create this large headdress. So much so that I was bumping into the ceiling fans. I then hunted down some black wings, a lacy, black leggings and found some cute lace gloves. I already had the boots. This was the start of my costume without makeup and contacts! Wait until you see my blacked out lenses! On Halloween I put the finishing touches, makeup and black out lenses! Check out my Pinterest board for some of my inspirational images for this years costume!